In my previous articles I’ve shown how to build KO components that start off with a data source of their own and are pretty self contained with respect to interactions with the rest of the page. But, in the first part of this article we built a tree control that’s I am planning to use as an Index page. So an action like ‘Clicking’ a link needs to affect another part of the application/web page. Solution? A light weight message passing system, that subscribes to events for you and publishes the event to all who have subscribed. Did you just wince at the sound of ‘message passing system’, fear not, it’s not rocket science, in fact it’s pretty simple. Take the two scenarios below. Here, reference by the id of the element, breaks the model view separation where the View Model has explicit knowledge of the View’s elements. This is hard coupling and should be avoided. Instead of attaching our event handler code directly, we list our function in a centrally located – let’s call it a ‘registry’ for now, using a unique string key. Next when the particular event happens we tell the ‘registry’ that a ‘named’ event has happened and that all subscribers should be notified. The registry takes the name and looks up to see if any functions where registered against it, if so, those functions are called. Thus, by using a central location for registering event names and their handlers, we have decoupled View and ViewModel. Now View can raise an event, ViewModel handles the event via KO’s event handling mechanism and then tells the central registry to dispatch a named event to all the subscribers. The subscribers need not be a part of this ViewModel, they could be part of any ViewModel on the page. They would register to listen of the ‘named event’ by providing an event handler function. This is the key, no ‘ids’ need to be shared across ViewModels. Once the named event occurs the event handler functions are called. Now that we’ve got an idea of how we can decouple the UI from the view model and still pass data around components, let’s use AmplifyJS as our ‘events broker’ and see what it takes to implement it. Amplify was created by the team at http://appendto.com/team and is made available under MIT and GNU OSS licenses. First up it simply raises an alert that says hello with the name of the node. We have also setup the node to flip the expanded flag. If we run the application now and click a node, we’ll see the popup. So far so good. The node has directly responded to the click event. As you can see the call to ‘raise’ or ‘publish’ the event via amplify is pretty simple. All we have done is specified a string key, and then passed on the value we want to event receiver to get, which in this case is the nodeTitle. We could have passed the entire node if we wanted. Note: I have removed the alert from the nodeClicked Event. Now we need another component to subscribe to this event and handle it when it occurs. The node click is supposed to be handled by a ‘Content Pane’ component that pulls content from another source. For brevity, I’ll ‘re-use’ the greeter component. We update the greeter component such that it handles the click event and updates the greeting. – Providing a function that will be called when the event happens. In the function we have changed the greeting property of the viewModel. 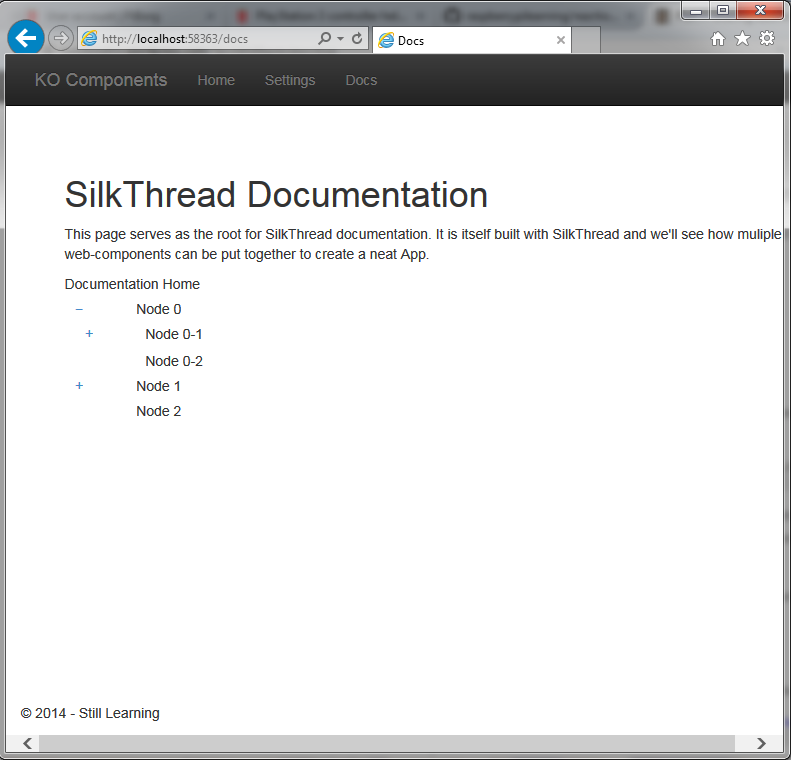 This page serves as the root for SilkThread documentation. web-components can be put together to create a neat App. Also note that the node has collapsed because of the code we wrote to toggle the expanded state. SignalR is another example of a Pub-Sub system that maintains subscribers on the server and publishes actions to all connected clients. But it is used across server and client systems. So as you can see the Pub-Sub system is a versatile software development pattern that we leveraged on the client side today. That concludes this sub-series of my overall Silkthread series. Next we will see how we can use Amplify to make http requests and send data to server and retrieve data back. The code as always is on Github. This specific branch is saved as Part7-2. Continuing my account of using KO Components and the building of the Silkthread SPA, today I am going to build another component – a Tree view component. Note: All my articles on KO Components are now categorized and you can bookmark the this link for easy reference. All future articles will automatically appear in that list. No one really uses a TreeView in a public facing Website today, but the underlying hierarchical data representation is still very valid and the TreeView has transformed into a series of Folding panels, cascading dropdowns, CSS Menus or in case of mobile devices cascading set of lists. How to layout the TreeView, creating the Tree and TreeNode components (1/2). I am starting with v6 label of my BuildingSpaWithKO project in Github. 1. First up, we’ll add a new ‘page component’ called docs. The component is pretty self explanatory, it has two properties, title and data. The title property has a default text but is an observable, so if we bind it to an html element if will be updated in the UI if we decide to change the Title at runtime. To register our new page we update the app.js by adding the new page definition to it. To navigate to the ‘Docs’ page we add a link in _Layout.cshtml page. as seen below the href is pointing to the page-name we registered above. With the Docs page in place we can get down to the business of creating the actual Tree component. The treeNodeViewModel has four fields and a function() to store the information and react to actions on it. url – A relative or absolute URL to navigate to when user clicks on the node. nodes – A collection of more treeNodeViewModels that are child nodes of the current node. Note that, the nodes collection essentially makes the view model recursive. expanded – A property storing the state of the current node, as to whether its child nodes are shown or hidden. This is applicable only when the nodes collection has more than one element. changeState() – This function is attached to the click event of the span element in the view. The span has the text + or – depending on the value of ‘expanded’ property. The tree-node is wrapped in a <ul> just to make use of Bootstrap’s default indentation. If you want you can use any markup. The <div class=”row”> is where things get interesting. We have two columns in the row. The first column is rendered conditionally. We check if there are elements in the nodes collection. If there are one or more nodes we check the expanded() property to see if we should render a [-] or a [+] using an anchor tag. We also attached the click event of the anchor to the changeState function. The second column is a span that’s bound to the title property of the tree-node viewmodel. Finally we need to render the rest of the nodes so again we check if the nodes collection is empty or not. If there are one or more nodes we loop though each node and render a tree-node itself with the current instance of the node object as provided by KO in the $data variable. nodes – A collection of node objects. The markup for the Tree component simply binds the nodes collection from the viewModel into a unordered list. 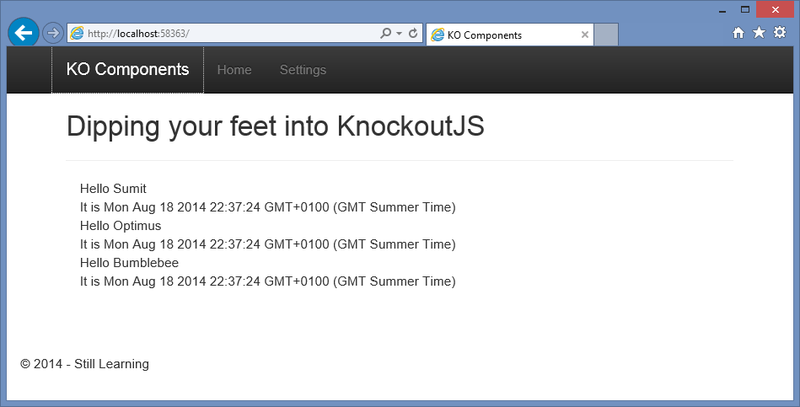 We go back to the app.js file and add our two new components to the ko.components’ list. Now that we’ve got the components in place, let’s add some dummy data to bring up the tree. We go back to the docs.js file and update the data source. Now that we are setup with the new components lets run the app and see how it works. Notice ‘Node 0-1’ and ‘Node 1’ are not expanded by default but ‘Node 0’ is. This is because these nodes have the expanded property explicitly set to false. By default expanded is assumed true. So we have a functional Tree layout. However clicking on the nodes don’t do anything because their HREFs are empty and there is no ‘click’ handler to do something with. Initially I wanted to introduce AmplifyJS in this article itself, but this one is already 1500+ chars and is straining on everyone’s patience. So I am going to split up this article and introduce AmplifyJS in the next article where we’ll see how we can use it to handle events and share data across components. In Part 4 we have seen how to use History.JS along with Crossroads.js to achieve proper client side routing and maintain browser state for proper back button navigation. However, SPAs often have complex page states for example a page with tabbed data or grid data with a particular filter. One of the ways we can make a particular Tab of data ‘bookmark-able’ is by including the selected tab information as a part of the route. Thus, the particular tab becomes a part of the URL and can be navigated to directly or pushed to the browser history and retrieved on back button. 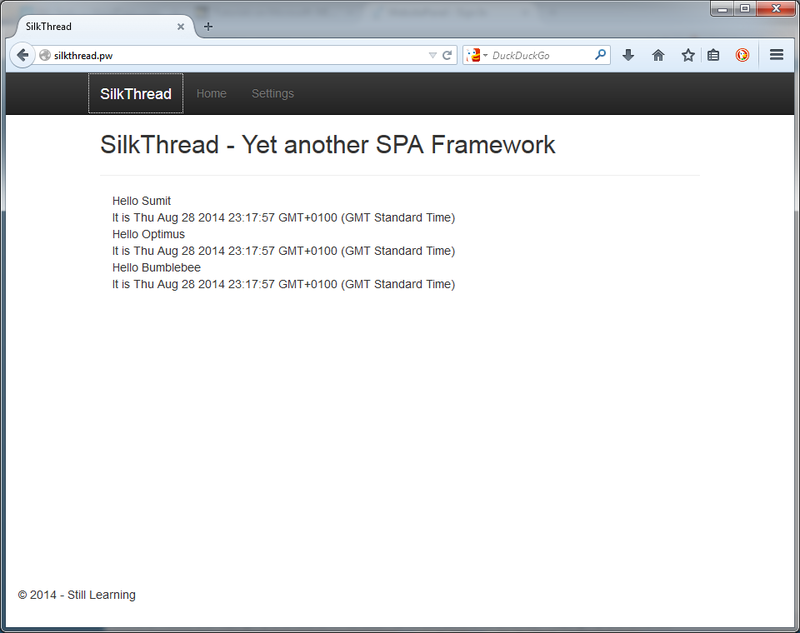 As you may have noted, our SPA has a name now – SilkThread and a site of it’s own http://silkthread.pw. 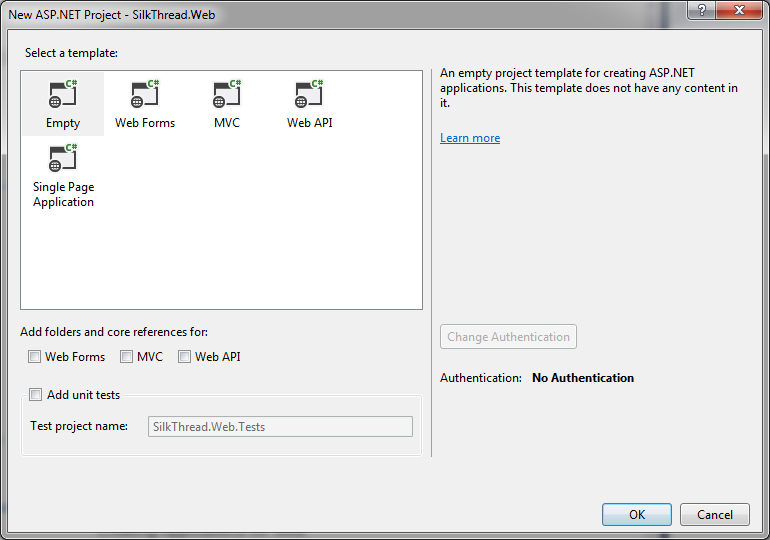 Today we’ll create a Tab-Item component that will working with SilkThread’s routing mechanism. Important: When I started this series KO Components was still in Beta, since then version 3.2.0 has gone live and is now available on Nuget also.This article onwards, I am using the release version from Nuget. We have been using ‘’magic strings” for representing routes, component names and so on. Multi-use components are used more than once, and complex views might be composed of multiple components. Relying on magic strings can be error prone and ‘difficult to maintain’. Why? Well imagine that you have created a component called drop-down in the drop-down folder. Now when you access it elsewhere you specify a magic string ‘drop-down’. But does the next person looking into your code know what it signifies? Is it the component name or the folder name or file name or just a random key? However if you accessed the string via a literal app.components.dropDown.name it will be amply clear that that string is for. So before our framework gets any more complex, let’s take a stab at cleaning up our magic strings. As we can see this is a simple JS object that splits pages and components into different types and registers each sub object represents a component with two properties name and template to start off with. Now we update our startup.js to use the appropriate component name and template names. Going forward, we’ll register our components via the app.components object. We have to tell Require there is a global app object now, so we update the require.config.js and add the app/app route the list. The library is by default installed under the Scripts folder. I’ve moved it to the ‘Scripts\underscore’ subfolder. Like the app.js earlier we’ll register Underscore in the require.config.js as well. With these two modifications to existing code set, we’ll start with the actual component. A tab component has two parts, the tabbed header and the panel showing the tab’s content. If we consider the Tab as a menu item it could be a different page altogether. But at any given point a tab control shows only one panel, which is logically related to the selected tab. 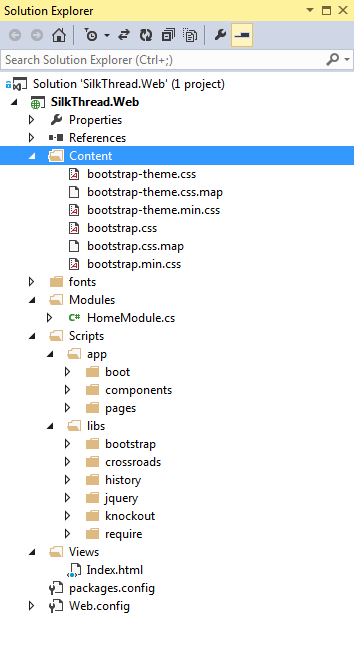 To start off with we’ll create a component – tabbed-navigation. The tabbed-navigation component will be the top-level container that will be responsible for showing the tab headers and the selected tab’s container panel. The container panel will be a placeholder div that will be replaced by the component that needs to be shown for the selected tab. We can configure each tab to show a different component. It has a simple layout using <ul> and the boot-strap styling classes nav and nav-tabs. Inside the <ul> we loop through an array of tabs items which is going to be encapsulated in the tab-navigation.js view model. In the loop we add a <li> that has the style active if the viewModel tab’s isSelected property is set to true. This sets the active style from Bootstrap. In the <li> we have an anchor with two data-bindings. First is the text that’s going to be shown, next the url that’s bound to the href attribute. Finally we have the <div> tabPanel. This is bound to a component which is initialized with the name and params properties. The name is bound to the selected tab’s component property (so our viewModel has to be able to return a selected tab). In params the only parameter we are currently sending is the name property, which is again picked up from the text property of the selected ViewModel. The tabsNavigationConfig object has a constructor function that has the list of tabitemConfig objects and the index of which of the tabs is selected. If you are still wondering as to why we are having a separate datasource for the component, it is simple. We want our component to be re-usable at multiple places, in the same page if required. Hence if we can decouple the data-source from the ViewModel we can configure any number of tab-navigation components with different data-sources. The ViewModel would only be concerned with the rendering and event handling limited to changing of the tabs. With the data source ready, we’ll setup the viewModel of the tab-navigation component. I have tagged each relevant line of code with an Index. You can click on them to see more details. #1: We start off by declaring that we refer to Underscore.js. #2: Underscore is assigned to the variable _ . #3: We create three cache variables that are a part of the module rather than the viewModel constructor function. These are the list of tabs, the selected index and a flag indicating whether we have some cached information or not. When navigating to a tab we will get routed via the settings route. This will reinitialize the viewModel, so if we have the values cached we can use them instead of initializing the tabbed control everytime. #4: The viewModel constructor function tabbedNavigationViewModel which takes in an initialization parameter, and may have a tabsConfig property. The tabsConfig has an array of tabs and the index of the selctedTab. #5: We check if the module is being initialized the first time around. If so, we set the incoming tabs collection into the cache and mark the module as initialized. #6: We initialize the tabs with the list in tabs cache. #7: We set the default selectedIndex to 0. #8: Pure Computed Observables: We have a new type of Observable introduced in KO 3.2.0 called the pureComputed. We know KO had computed observables that automatically updated themselves when their constituent observables changed. However, they suffered from one drawback. Computed observables were always triggered as soon as the constituent observables changed, even if the computed observable was not bound to a view element. This was a performance hit. To resolve this we now have pureComputed observables that get re-calculated only if they have subscriptions, i.e. someone is waiting to update itself based on changes in the pureComputed. Here we have declared the selected property as a pureComputed and it returns the selected Tab. The selection changes whenever the selectedIndex changes. So anytime the selectedIndex changes the selected property returns the newly selected tab. As we will see in a bit, this renders a new container. #9: We check if this viewModel is being created as a result of navigation (all cases except of first time page load). If it is due to navigation the route parameter is populated and we use it to select the particular sub-tab indicated by the route property. 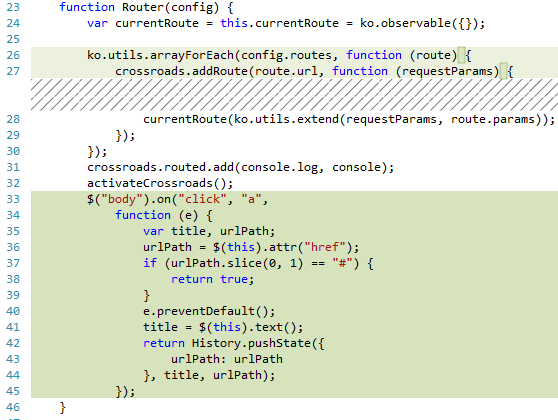 #10: The selectByRoute function, called everytime the route changes. #11: We use the Underscore library to find tab in the tabs collection. The syntax of _.find expects the array of items to look into and a comparison function to call for each element in the array. It returns the first element it finds. #12: Once we’ve found the element we use the current selected index to set the isSelected flag to false for the current tab. #14: Next we call the select method. #15: The select method sets the isSelected property of the new tab and updates the selectedIndexCache value for future use. Now that we’ve seen the structure of data we need and how that data is used lets see how we can use them. The Tab component is used inside the Settings Page component. So someone has to initialize it in the Settings page. There are two items being passed in the params property, tabConfig and route. The tabConfig property has the initialization parameters of how many tabs, their text, their URL and so forth. Refer to the tabNavigation viewModel section above. The binding parameters imply that the Component View Model that’s backing this HTML has to provide he tabbedNavigation and route properties. The crux of the component view model is the init method that’s called from the constructor function first time around. It need not be called init though. This function initializes an array and pushes in 5 instances of the tabitemConfig that we defined earlier. Since this is a demo we are simply doing a loop. For a real life scenario we would instantiate each instance with a relevant name and more importantly route to a component that should be visible when the tab is selected. In our case we are setting each route to point to the previously created ‘greeter’ component. So for every tab selection we’ll show a greeter component and if you refer back to the original markup at the top you’ll see we pass the selected tabs’ text property to the greeter as a parameter. So the greeter shows name of the tab selected. 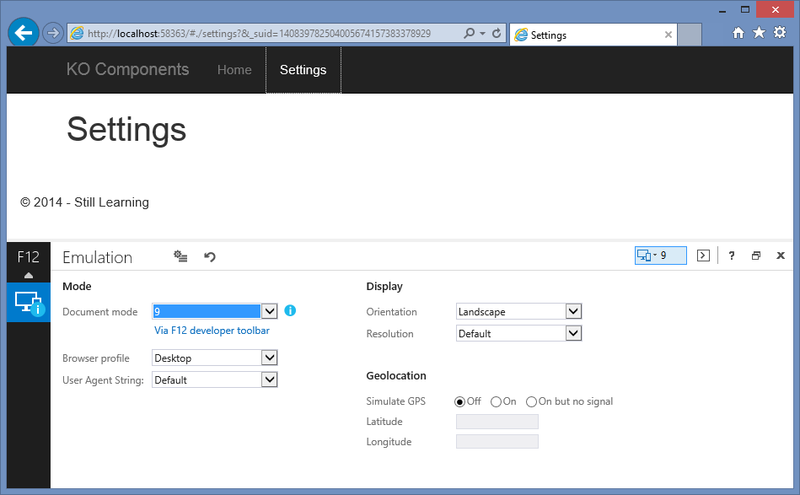 – Clicking on Settings 1 tab, ‘navigates to that tab.Notice the route changes to settings/tab1. This corresponds to the route we setup when initializing the tabitemConfig object. Now we can click on the Browser back button to navigate back to Settings 0 tab, and go forward again to come back to Settings 1 tab. When you navigate you’ll notice that the timestamp of Greeter component keeps changing this is because the greeter component doesn’t cache the time stamp so everytime the constructor function is called, the time gets updated. In conclusion we saw how we could create a ‘tab-component’ using KO’s component model of development. 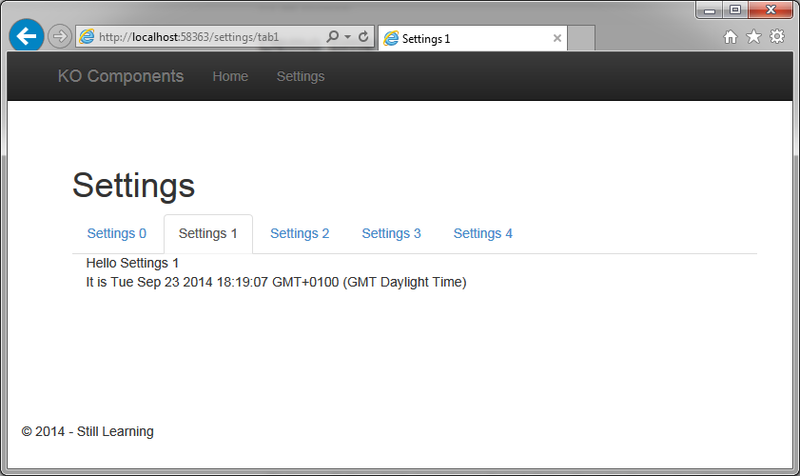 Next we’ll see how we can use different components in different tabs and how to call server to get/put data. To try the entire thing online I decided to purchase a domain and the cheapest one was a .pw. SilkThread sounded like a nice name for a framework that was aiming to string together a series of well written libraries. So here we go, I am going to document my steps on creation of the first cut of http://SilkThread.pw, powered by Nancy and SilkThread itself . Well, it’s not a who, but a What. Nancy FX is an Open Source Web Framework in .Net. Conceptualized and initially built by Andreas Håkansson and supported by an awesome community of .NET devs, it’s now 3+ years old (here’s the list of the contributors). It is inspired by Sinatra in the Ruby world, but I don’t know enough about Sinatra to talk more about the history. It’s primary goal was to help build HTTP services in .NET. However, Nancy is more, it can serve up static content, html and even supports multiple view engines. 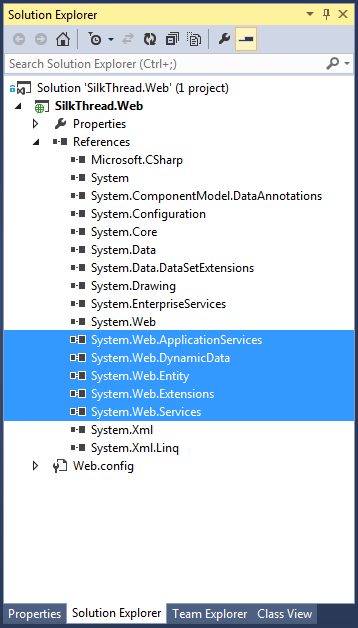 So its like the best of both AspNET MVC and Web API worlds in one neat bundle. 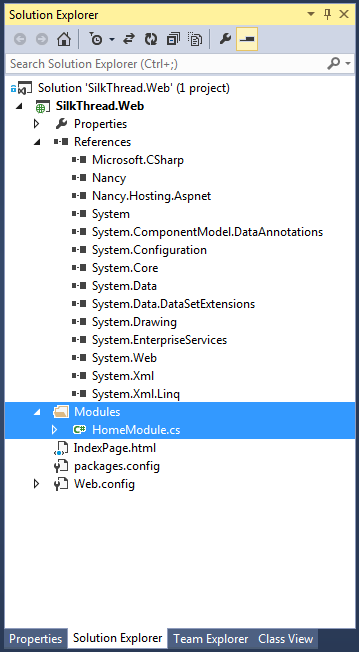 Why NancyFX instead of AspNet MVC? Well, no reasons really! Since my SPA effort is aimed at learning stuff and all of it is Open Source, I decided to try an Open Source framework that’s contemporary to the Asp.NET MVC! 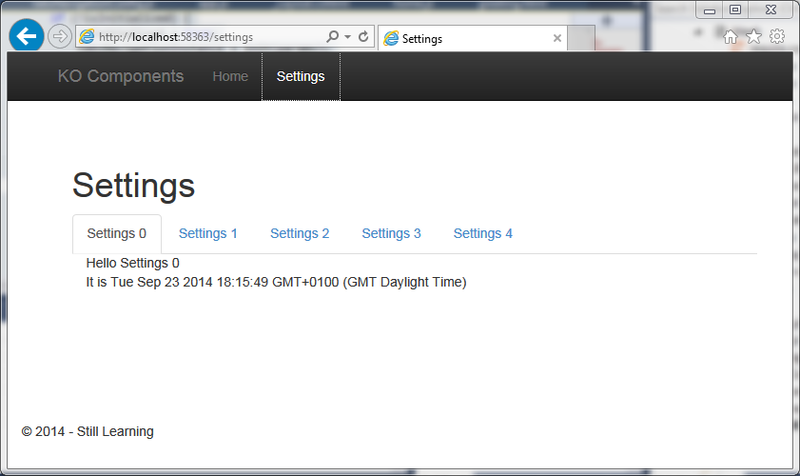 My only requirement was that it should be host-able on IIS via my shared hosting provider. Once my Twitter pals Phillip Haydon and Filip Ekberg confirmed this is possible, I was all set to give it a go. I should also mention the gentle nudges from Phillip and Jonathan Channon to try out NancyFX contributed handsomely too . So no ‘political’ reasons, just an eager beaver trying out a new framework. 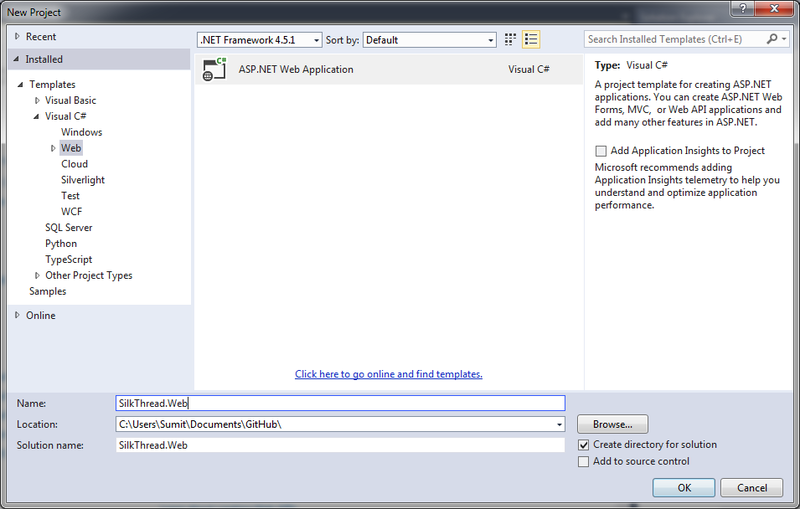 You have already seen how to do everything I do here using ASP.NET MVC. Nancy has some neat Visual Studio project templates, so you can get started directly using these templates. But that’s less of fun than learning things ground up. 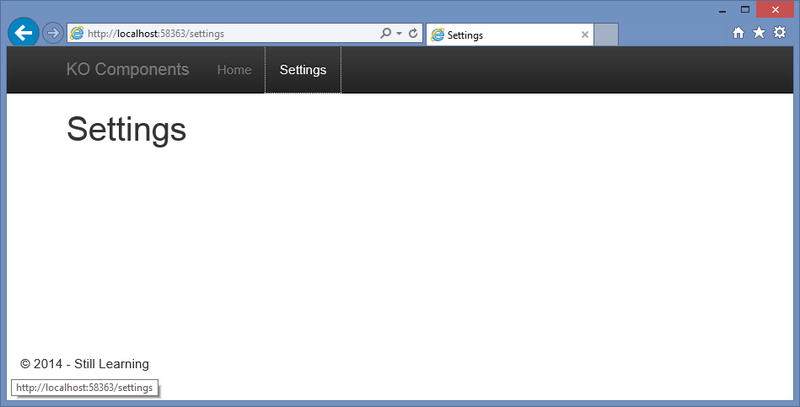 So I decided to start with an Empty Web template. On clicking Ok, a new empty project is created, however we’ll see it has got a bunch of dependencies that I don’t think are required. So we remove the ones shown selected above. These two packages are all you need to get started. Next I’ve updated the HomeModule to inherit from Nancy.Module. In the constructor I’ve added a root path and assigned a method that returns a ViewRenderer. We’ve passed the IndexPage.html to the ViewRenderer because we don’t want any sever side processing done and want to show the HTML as is. The IndexPage.Html simply says “Hello Nancy”. Well then, the myth of OSS projects being complex to get started with, stands BUSTED! Yes, Nancy is truly a low ceremony, awesome web framework. But this is not what we want to setup do we? We want a nice Bootstrap Styled SPA! Well, let’s get to work. Created a Views folder and moved the Index.html to it. 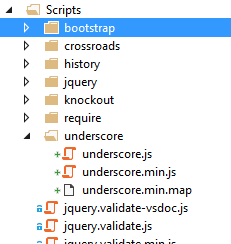 Next, install the bootstrap nuget package and removed the scripts folder as we already have the scripts in the libs folder. The ‘Oatmeal’ has greeted us! Nancy tries hard to tell us what happened and it seems it looked at lots of places but couldn’t find a file. Fear not, it’s a small detail but it’s a safe default. 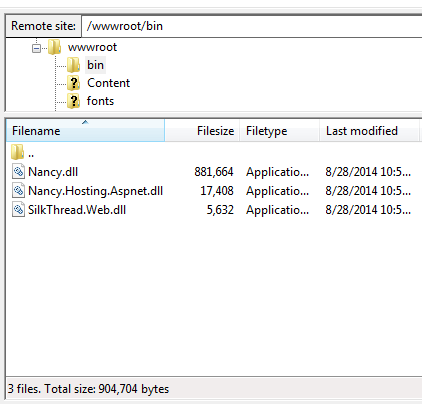 Basically Nancy serves static content off the Content folder only by default (html files are served from any folder as long as you’ve got the routing right). So when our Index page is trying to access the Scripts folder, things are falling over. To use a custom folder structure like we defined above there are two options a. We move Scripts folder under Content and roll with it OR b. we tell Nancy about our folder structure. Let’s try the second option, it’s rather easy to do so. Override the method ConfigureConventions method and use the StaticContentConventionBuilder helper to add folders that you want Nancy to track. With those changes done, if we fire up our app, it will come up smoothly. Imported them into the project. Tear hair out because Web Publish keeps giving a weird error. Either provider or Visual Studio is broken. (Note: I will be updating the site to be a little more useful so expect it to change over time). If you look at the deployment folder it’s got only three dlls, with the total deployment size < 1MB. That’s pretty cool! Nancy FX is a neat little framework with a tiny footprint for quick dash web projects. However, I have not even skimmed the surface of it’s abilities. To try out more I’ll continue to build SilkThread’s site using Nancy. So there will now be two streams of articles in parallel! One, features in SilkThread and the other about updates to the Site using Nancy. Special Thanks to Phillip Haydon, for proofing the Nancy bits and pointing out some gotchas I comitted as a nOOb. 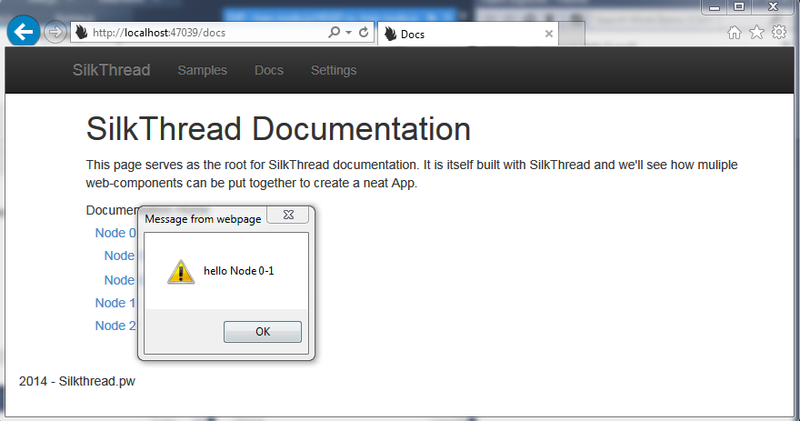 The source code for SilkThread.pw is going to reside at Github, I’ll try to branch it as I go! Part 3: How to use Crossroads, Hasher and JS Signals to implement client side hash based routing. At the end of the third article we saw some problems with hash based routing primarily in terms of accessibility and search engine indexing. Also the fact that hashed URLs are semantically incorrect gives us enough reason to look for alternatives. Today we’ll explore how we can overcome some of these problems and discover some new ones . HTML5 pushState usually refers to a set of APIs that HTML5 browsers can support, to give more control to the developers on the Browser URL and the Browser’s back button behavior. These include pushState, replaceState and the event popState. Here is a nice primer on pushState on developer.mozilla.org. Essentially, when you want to add a URL to the history you push the URL into browser history using pushState. This is done for free when you click on a link (or type in the URL) and a server returns the page. However, if you wanted to build an AJAX based navigation system where you want to intercept all link clicks and show content dynamically loaded via AJAX, the browser doesn’t know the URL’s correlation to the content. So you have to tell it explicitly what the URL is (e.g. when we are showing the ‘Settings’ page, the URL should be /settings). HTML 5 pushState and related APIs make this easier for us. Ajax based apps also have had trouble with the browser back button. As users we are trained to hit the big honking ‘Back’ button on the browser when we want to go back to the previous page. This is correct expectation and our Web Apps should respect that. Doing AJAX based page/component loading can break this because you may have content loaded based on user interaction that is not recoverable when user hits the back button. So ideally we should use the new found ‘pushState’ functionality to indicate on the URL the exact location of the current content that is being shown. Thus when a user hits the back button we can use the URL to load up the previous content again. Back button in HTML5 browsers fire a popState event that can be handled for these purposes. Doing all this manually is a bit of boilerplate. In Part 3 we saw how crossroads+hasher does it (Back button is fully supported for # URLs. Today we’ll see how we can use another library called History.js. Reason for exploring History.js is that it supports the new pushState API and falls back on Hash-based routing for browsers that don’t support pushState, (one such browser, is IE9 and when I started, one of my ‘undeclared’ goals was to support IE9 and up). You can get the last version of my sample from the Part 3 branch on Github. You can clone the History.js repo from Github here. 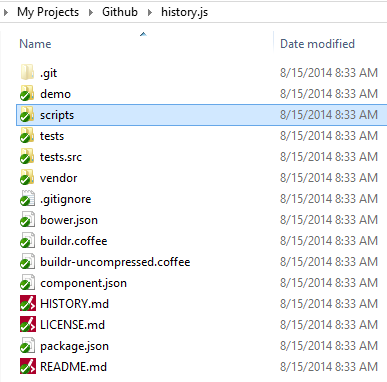 The Scripts folder has the following the sub-folders. Mechanics behind these folder is actually pretty neat. History JS depends on availability of the JSON object so for older browsers that don’t have JSON parsing built in, it refers to JSON2.js. It bootstraps itself differently based on what library you are using. So there are various adapters that bootstraps History JS correctly with the respective library. The bundled* folder contains one file per-adapter. Each file contains JSON2.js, the respective Adapter and the entire HistoryJS library. So all you have to do is pick the file from either the bundled-uncompressed\ folder or if you want to use the minified version use the same file from the bundled\ folder. Note there are two subfolders under bundled\ folder – html4+html5 and html5. If you don’t want to support HTML4 the library is trimmed a little further, but we want it, so we’ll dive into the html4+html5 folder. If you want to experiment with adapters you can pick the adapter and the History.JS file from the compressed or uncompressed folders. 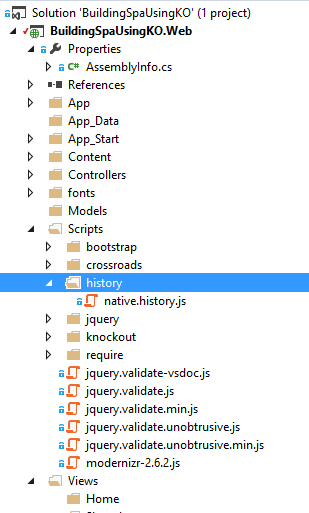 In my sample I’ve picked the native.history.js file from the bundled-uncompressed\html4+html5 folder. 2. Next we update the App\boot\require.config.js to load HistoryJS after bootstrap is loaded and remove the Hasher.js dependency. 3. Modifying our Router: We will need multiple changes in our Router.js file to configure it to use History.js instead of Hasher.js. b. Handling anchor clicks to prevent server requests directly: This is actually a big deal. Typically we navigate to a different page by specifying an Anchor tag that has a href pointing to the new page. It may be a full path or partial path. When user clicks on an anchor the request is sent to the server by the browser. When using Hasher we worked around this by using href’s that started with a #. This told the browser that the reference was in the current page itself and then we hooked into the event and did our AJAX magic to load a new page. This also had the side effect of putting a # in the URL irrespective of the browser. To avoid # in the hrefs, we need to handle all href clicks globally and push the path to HistoryJS for managing and raising statechange events. To do this we assign a click handler for all URLs inside the HTML body tag. We check if the href attribute starts with a #, it means it’s a deliberate reference to some place in the current page and we let the event pass through. If the href doesn’t start with a # we push the path to History using the pushState function. Note we are not using window.pushstate because we want History to manage the pushState for older browser that don’t have a native implementation. #1: Gets instance of the HistoryJS. Next we bind a event handler for the “statechange” event. #4: If the urlPath is undefined, then we check if the State’s hash length is > 1. This is an indicator of a bookmarked URL and we slice out the path that crossroads needs and let crossroads navigate to it. #5: This is invoked on activation and by default our router navigates to the home page. Well, we have made all changes we need so it’s a good time to test it out. I have deployed it to Azure websites via Github deploy, so as soon as I commit to the master branch it updates the http://buildingspausingko.azurewebsites.net/ (which unfortunately is down due to unscheduled Azure maintenance at the moment, so instead of my VM accessing the site, we’ll ‘fake it’ using IE11 DOM manipulation). I emulate IE9 DOM on IE11 and I get the rather ugly hash based URL. Well, old browser users have to live with some ugly stuff unfortunately. But here is the good part, if users bookmark that URL, History JS will do it’s best to return users to the same URL. 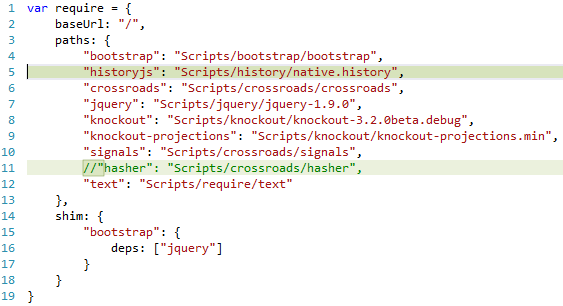 So we’ve now replaced the Hash based routing of Hasher.js with the pushState based one by HistoryJS. We have also seen how HistoryJS gracefully falls back when using older browsers. With that I’ll end this article here and push the server side manipulation to the next part. Just so you know, on modern browsers that support pushstate currently if we visit the /settings page directly it will show us an invalid URL. 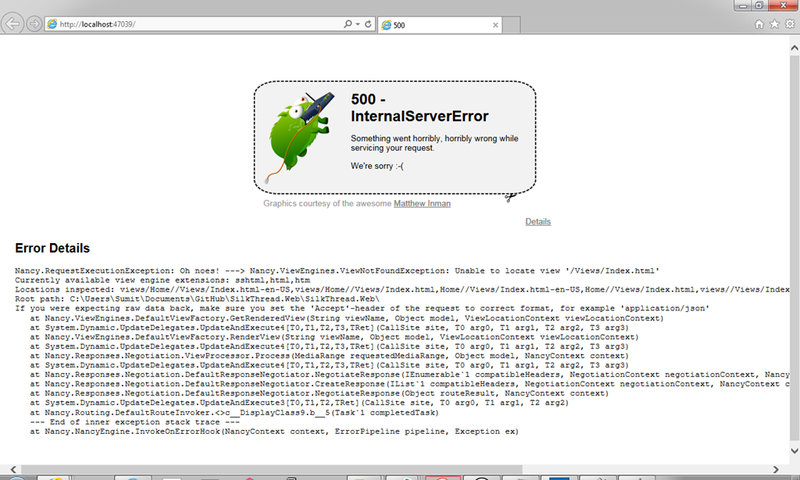 Ideally it will show a 404, but my 404 redirection is broken so it’s showing this weird error. Eitherways, we’ll end up with an error. In the next part we’ll see how we can fix this.